Welcome to connect2, the online resource booking systems for The Media School at Indiana University Bloomington. We have a variety of equipment that can be booked by students in associated classes. PLEASE NOTE: The below email addresses are monitored on business days, Monday - Friday, 8:00 AM - 5:00 PM. Emails sent outside those times will be monitored on the next business day. The phones are monitored only during the Franklin Hall Equipment Checkout and RTV Checkout & Lab hours, respectively. Equipment Checkout and Computer Labs for both Franklin Hall and RTV are closed on Saturdays. Systems Maintenance is performed on the second Tuesday of every month. During that time, Connect2 will be unavailable and the equipment room staff cannot check out equipment. Systems Maintenance begins at 7:00 PM and runs until completion, which may take one or more hours. Equipment Checkout and/or Production Lab hours may be limited or close early on those days. All users must agree to the terms and conditions of this Agreement to use equipment or facilities owned and operated by the Media School. “Booking(s)” refers to instances in which students use the Media School’s electronic checkout system to reserve equipment or facilities in advance, or to instances in which an approved Media School staff member permits a “walk-in” checkout of equipment or reservation of facilities. “Strikes” are recorded instances in which the student has failed to comply with policies regarding the booking and equipment or facilities usage process. 1. GENERAL ELIGIBILITY. The student must be active in an approved Media School course to be eligible to book and use Media School equipment or facilities. Non-Media School students, and Media School students not enrolled in an approved course in the present academic session, are not eligible. The student will lose eligibility to borrow equipment or reserve facilities if they drop or are otherwise removed from their eligible course(s) during the academic session. The Media School reserves the right to cancel any booking where the eligibility of the student cannot be confirmed. Any student not meeting these eligibility requirements may only use Media School equipment or facilities with written permission from the Media School’s director of facilities and technology. 2. IDENTIFICATION. The student must display their Indiana University ID card when checking out or returning equipment or facilities. The equipment or facilities will only be released to the eligible student associated with the booking. 3. ELIGIBILITY LIMITATIONS. The student may not book equipment or facilities prior to the first class meeting for an approved course, and booking eligibility will end at a time agreed upon by course instructors and technology staff. Bookings are limited to the present academic session, and are not permitted between academic sessions without additional written approval from both an instructor and the Media School’s director of facilities and technology. Bookings may be limited over breaks that occur during an academic session, and the Media School reserves the right to cancel any booking that attempts to do so. 4. FACILITIES USAGE. Students may book certain facilities or rooms through the Media School’s electronic booking and checkout system. Some facilities or rooms require the supervision of an approved Media School representative, and if an approved representative cannot be present during the desired booking time, that booking may be subject to cancellation. The student must return all facilities to their default state and arrangement after usage. 5. EQUIPMENT USAGE. By agreeing to these terms and conditions, the student accepts responsibility for all equipment the student uses. The student agrees to use the equipment in a careful and proper manner, complying with any policies instituted by the Media School or the University. The student agrees to safeguard the equipment at all times and not to leave the equipment unattended or in a vehicle, and may not store equipment in a vehicle overnight. The student agrees to transport equipment appropriately and to use their best efforts to protect it against inclement or extreme weather conditions, including excessive cold or heat. Any degradation that occurs beyond standard and anticipated wear and tear is the sole responsibility of the student associated with the booking. A student who fails to comply with these terms and conditions may be responsible for any or all costs of repair or replacement for damaged equipment, may receive one or more strikes, and/or may have their eligibility revoked. The student agrees not to use equipment and facilities in a manner than threatens the safety of the student or others. 6. EQUIPMENT USAGE LIMITATIONS. The Media School equipment may only be used for Media School-related or approved course projects. If it is determined that a student is using equipment for profit, or for reasons other than approved course projects, the student’s eligibility may be revoked. Equipment is limited at a per-class level, and students will only have access to equipment after receiving in-class training. If a booking includes equipment not permitted for a class in which the student is enrolled or for which a student has not received training, the Media School reserves the right to cancel that booking. 7. EQUIPMENT RETURN. Upon the expiration of the checkout period or earlier termination of a student’s booking, the student agrees to return the equipment to the school in good repair, condition, and working order, ordinary wear and tear resulting from proper use excepted. The student will deliver the equipment, at the student's cost and expense, to the same place in which the equipment was received by the student. The student must be present when returning equipment, the student cannot transfer that responsibility to another student, and the student must remain present for the entirety of the return / check-in process. Pay to the Media School the replacement cost of the equipment. To pursue any other remedy at law or in equity. 10. LATE CHECKOUTS AND RETURNS. The student has a 30 minute grace period for booking checkouts and returns. If the student arrives more than 30 minutes late for a booking, the student will receive a strike, and the booking will be canceled automatically. An automatically canceled booking may restrict the student from booking the same items later the same day. However, bookings may be canceled or rescheduled by the student up until the agreed upon checkout time. If the student returns equipment more than 30 minutes late, the student will be charged a late fee of $2 per hour. If late equipment is returned on the assigned return date and before the checkout room closes, the student will receive one strike. If equipment is returned on the day following the return date, the student will receive two strikes and will be charged a $20 late fee. For any return that occurs two or more days following the return date, the student will receive three strikes, the student’s eligibility will be revoked, and the student will be charged an additional $20 per day late fee. All late fees will automatically be charged to the student’s bursar account. 11. HONESTY AND ACADEMIC MISCONDUCT. Falsification of any information related to booking or equipment or facilities usage may be considered Academic Misconduct. 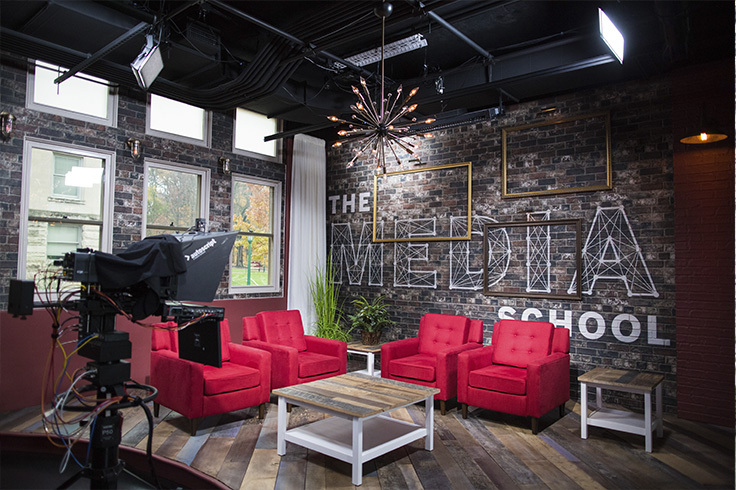 The Media School may cancel any booking for which falsified information is submitted and may revoke a student’s eligibility to use Media School equipment or facilities. If Academic Misconduct is suspected, the appropriate Media School faculty and staff will be notified and the procedures in the Student Code will be followed. 12. VIOLATIONS AND STRIKES. Use of facilities and equipment is determined at the sole discretion of the Media School, and the student does not retain any right or ownership of facilities and equipment related to these terms and conditions. If the student violates these terms and conditions, they may, at the Media School’s discretion, be subject to late fees, strikes, or temporary or permanent revocation of their eligibility to book or use equipment or facilities. The appropriate Media School faculty and staff will be notified in the event of a violation of the terms of this agreement. A student’s eligibility will be revoked upon receiving three strikes but may be reinstated upon review by faculty and staff or upon the start or a new academic session, at the sole discretion of the Media School.